There’s finally some consistency in the power rankings. The top eight teams stayed in the same order as last week, and only Nebraska, Iowa and Northwestern moved at all. As the conference’s top teams start to play each other, there should be more and more separation. Or it could just remain a jumbled mess. Who knows. Without further ado, the sixth edition of Inside the Hall’s Big Ten power rankings. 12. Penn State (10-12, 2-7) (LAST WEEK: 12)…The Nittany Lions are in the midst of the most difficult stretch on their schedule, and they haven’t fared well. After falling at Indiana and at Ohio State, Penn State now faces games against Wisconsin, at Iowa, and at Michigan State. 11. Northwestern (12-8, 2-6) (LAST WEEK: 10)…The slide continued with a home loss to Purdue on Saturday. The Wildcats have lost three consecutive games since upsetting Michigan State. 10. Iowa (11-11, 3-6) (LAST WEEK: 9)…The Hawkeyes surprised everybody with road wins against Wisconsin and Minnesota to begin the conference season, but they’ve lost five of six and are sinking fast. 9. Nebraska (11-9, 3-6) (LAST WEEK: 11)…They’re not flashy, but the Cornhuskers keep getting better. Their win at Iowa last week may have turned the Hawkeyes’ season in the wrong direction. 8. Illinois (15-6, 4-4) (LAST WEEK: 8)…The Fighting Illini were 4-1 after an upset of Ohio State, but they’ve dropped three straight with a game against Michigan State still to come on Tuesday. 7. Minnesota (16-6, 4-5) (LAST WEEK: 7)…An overtime win against Illinois has the Golden Gophers back in the middle of the Big Ten pack. Even without Trevor Mbakwe, they’ve won four out of their last five. 6. Purdue (15-7, 5-4) (LAST WEEK: 6)…The Boilermakers don’t play again until Saturday when they host Indiana. That could be a critical game for the Boilers’ NCAA tournament hopes. 5. 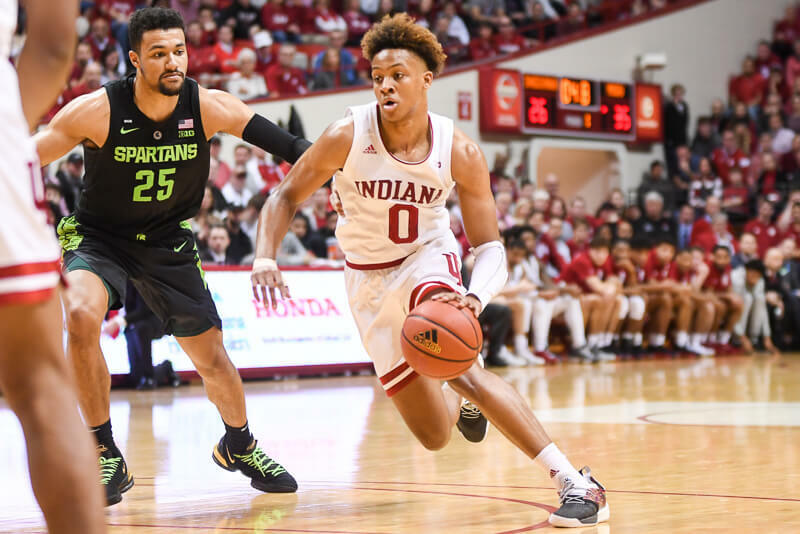 Indiana (17-5, 5-5) (LAST WEEK: 5)…The Hoosiers played well in a loss at Wisconsin, but couldn’t come up with any key rebounds late. They rebounded for a much-needed win against Iowa, but the lack of defense is still alarming. 4. Wisconsin (17-5, 6-3) (LAST WEEK: 4)…The Badgers are the conference’s hottest team. They’ve won five straight games, and they’re fresh off an impressive win against Indiana. 3. Michigan (16-6, 6-3) (LAST WEEK: 3)…The Wolverines are practically unbeatable at home, and they played with Ohio State on the road Sunday afternoon. Trey Burke is the real deal. Now if only Tim Hardaway Jr. would take better shots. 2. Michigan State (17-4, 6-2) (LAST WEEK: 2)…They took care of Minnesota at home, but will the Spartans suffer the same fate as Ohio State when they visit Illinois on Tuesday? 1. Ohio State (19-3, 7-2) (LAST WEEK: 1)…Michigan gave them a battle for a while, but the Buckeyes are starting to look like the unbeatable team many thought they could be before the season. They still have plenty have challenges left on the schedule, however, starting with a road contest against Wisconsin on Saturday. I’m not giving Wisconsin as much credit as the rest of the sports world. Who makes these schedules anyway? They get Nebraska and Iowa to start. Lose to Mich St and Michigan. Then get NW, Illinois and IU. They have 2 games with OSU, 1 with MSU, 2 vs Minny and 1 with Illinois remaining. They get through 2/3 of the schedule playing the obvious top 2 teams once. What a rip off. Let’s see how good they look in the end. I agree with these rankings. I hope that we can go 2-1 our next three games….if we do we will be in good shape heading into the end of conference play. This is probably accurate, but I would like to finish 3rd ahead of Wisconsin and Michigan. I think we are better than both. Our road game on Wednesday is huge. If we can win that game, we are in decent shape. We could make our season with two road wins this week. We would move back up into the top 15 where I think we belong and be poised to make a run for 3rd in the conference, which should earn a 3 or 4 seed this year. with the unbalanced BIG10 schedule some teams have an easier road than others, PUke only plays MSU and OSU once i believe so rankings don’t mean much right now. the only number i want to see is our seed on selection sunday. this team needs to get over the hump and bring it wedenesday night. time to get it done this week. GO HOOSIERS. 5-7 in the Big Ten does not seem very good, but that’s the very real possibility that the Hoosiers are faced with. Yuck. Maybe the Hoosiers can steal one on the road this week. If not, bye bye top 25, and may not get back in considering they will play only 1 top 25 team the rest of the way after Mich, which will be MSU at home. I think the worst case scenario will be 7-11 in Big Ten play putting IU at 20-11 overall and probably in the NCAA Tournament (firmly in with a win or 2 in the Big Ten Tournament). The best case scenario (IMHO) would be 11-7 putting the Hoosiers at 24-7 and probably a 4-6 seed in the NCAA Tournament (again depending on how they fare in the Big Ten Tournament). I don’t see the best case scenario happening. 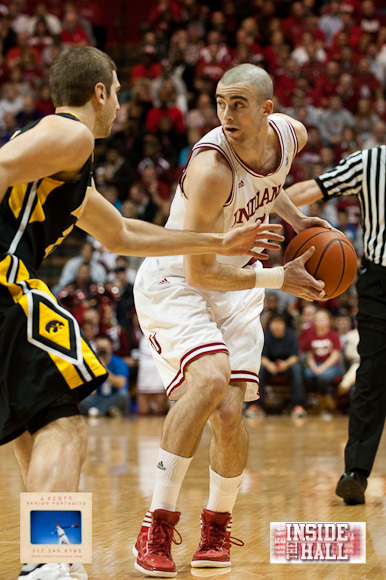 I think Indiana will finish 21-10 (8-10) and probably win a game in the Big Ten Tournament making them 22-11 overall. That should be good for an 8 seed. 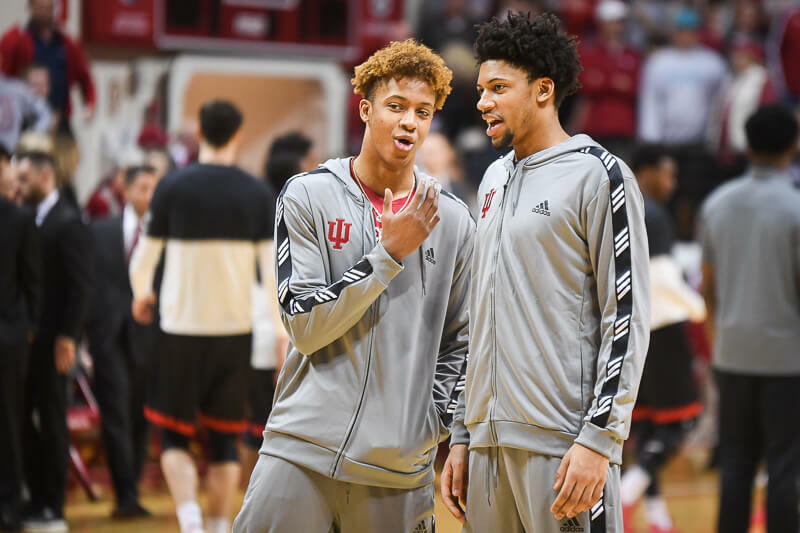 Right now, Lunardi has Indiana as a 5 seed. Given the team’s performance of late, I personally think that’s an optimistic finish for this team, but what do I know? I hope they prove me wrong. The Hoosiers should be dancing regardless. Barring major injury (please no) or an absolutely horrible finish (please no again), this team will be in the NCAA Tournament. 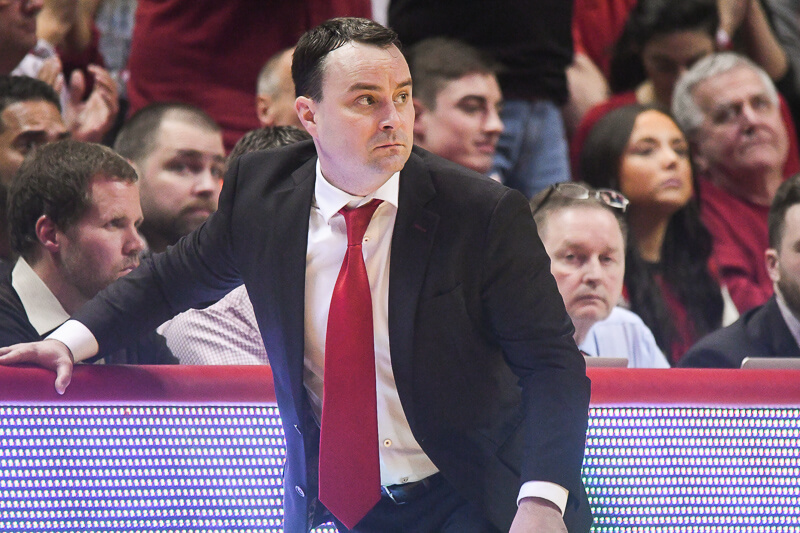 Beat Northwestern, Illinois, and North Carolina Central all at Assembly Hall, and this team will have 20 wins. Having said that, they better freakin beat PUke on senior night at Assembly Hall and that’s 21 wins. Anyone think this team won’t finish at least 2-6 the rest of the way in the Big Ten? I have to agree with you, I’m not buying into Wisconsin at all either. They are a fluke and when they do play someone that has a great chance to beat them they get all the calls. I’ve got them finishing 21-10…the RPI ought to get them in the NCAA IF they don’t lose in the first round of the conference toruanment. Maybe they will surprise…I think they could run the table on home games even with MSU in there. I’m thinking 22-9. IU beats purdue in Lafayette, loses @Minn, and vs MSU. I don’t think IU is in that bad of shape. Wins against UK, UM, and OSU will do them some good in the tournament. A few tough losses that I don’t think they’ll repeat. Young mistakes that shouldn’t be repeated, and a healthy Sheehey will help. Comparing their remaining schedule to ours I think we may have a chance to get into that 4th spot and get a bye in the B1G tourney which would be an accomplishment in itself. A win at Michigan may tell us who we really are. Did we knock off KY and OSU or not? Are we that team? Lose to both UM and PU, I think we are what we are. A middle of the pack Big Ten team, with a good enough resume’ for the tourney if we win the winnable games down the stretch. Looking back, I would have been pretty darn happy about that. I think you nailed it. We are either a 5 seed or an 8 seed. But making the tournament is a forgone conclusion. No one else in the country will knock off a #1 and #2. Heck, no one may knock off Kentucky again. Furthermore, the NCAA wants IU back in the Dance. Good for ticket sales. IU is firmly in the 4 spot without the hosing in Wisconsin. The losses to Minnesota and to Nebraska will hurt in the long run if they are .500 the rest of the way. They thought that they could just turn it on against Minnesota at home, but they came out flat. They were beating Nebraska easily, but they didn’t clamp down on the defense at the end. Wisconsin was a very winnable game, but they quit driving the ball and quit rebounding in the last 10 minutes of the game. Those first 2 losses would be forgotten with a win at Wisconsin which is a very hard place to pick up a win. They really need to pick up a couple of road wins to get the confidence that they can go anywhere and compete with anyone. I just want to see the team we saw in December. The last 10 games of the season are pretty important in the eyes of the selection committee. Iowa was the start of that 10 game stretch, lets give them something to talk about on that Sunday. Two wins on the road this week could go a long way for seeding and the confidence of this team. Agreed sir. Sure would like to be a 4 seed. Puts CTC right back in the Coach of the Year award. lack of defense in Iowa, but I wouldnt say alarming. We played very good D at Wisky and pretty decent in the PSU game as well. I guess we will get that question answered this week and Mich and PUke! Dont forget the ND win and the NCSU win on the road. Those wins, especially the ND, are really going to give us a boost in the RPI come tourney seeding time! The defense is going to need to be a lot better against MU and PUke because I seriously doubt we will put up 100+ points again. Hulls is going to NEED to step up because MU and PUke have some guys that could burn him all day. If we struggle down the stretch, we could get an 8, but there would be an unhappy 1 seed in that bracket! Nine games left (5 H, 4 A). I’m thinking 5-4 or maybe 6-3 plus the B1G tourney (let’s be conservative and say 1-1). That would put us at 23-10 or 24-9 with a .500 or better conference record. I think that 23 wins playing what will end up being a top 25 S.O.S will get us a pretty good seed. PU plays OSU just once (2/7 in Columbus), but they play MSU twice (2/19 at home). Everyone plays four teams just once (2H, 2A). Purdue plays both Wisky (L) and Nebraska (2/22) once at home, and Ohio St (2/7) and Minny (W) once on the road. On the other hand, we get Illinois (2/9) and NW (2/15) at home, and Nebraska (L) and Wisky (L) on the road. I think I would trade them schedules. How nice would it be to only have to play OSU once and not have to go to Kohl for a season?! Now, don’t get me wrong, not having to go to the lesser Assembly Hall is pretty nice, but I’d rather play there than in Madison. I agree, Miles. Oglesby was out of his mind and if some of those pretty well-contested shots don’t fall from deep, we aren’t talking about IU’s defense. I know, woulda coulda shoulda, but “alarming” is a bit of sensationalizing, Justin. If CTC can get VJIII to play with his head up and stop making boneheaded plays on about 75% of his touches then I will vote for coach of the year on the spot. Even if he can’t get him to play better and instead gives him more bench time I will give CTC coach of the year. Either play well or sit. All of our other players have had to produce to see minutes. Not sure if it’s a senior thing or something or what but VJIII continues to be my main cause of frustration in watching our games win or lose. Win Wednesday at Michigan and then win the most important game of the year IMHO AT PUKE and all is forgiven. The unbalanced schedule is even more pronounced in football. Sadly, even that doesn’t help IU. That’s the spirt —- win or lose, good play, mediocre play, or bad play —- EVERY occasion’s an occasion to criticize VJIII.